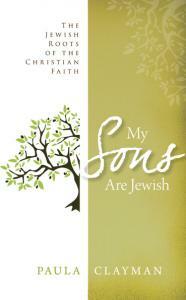 My Sons Are Jewish - The Jewish Roots of the Christian Faith written by Paula Clayman is one of the most comprehensive books on the subject. A must-read for every Christian practicing the Judeo-Christian faith. Enlightening, unique and enriching this book will not only lay the foundation for the Christian faith, but gives insight and thorough understanding of the Jewish people and their prominence in history. With this book you will find an increased faith in God, a deeper appreciation for God and His love for the Jewish people. A profound appreciation for His chosen people is also keenly acquired through this informative book.